Sometimes, I’m lucky enough to be sent a book by a publisher in order to give you my honest thoughts on it. (Although the truth is you can always depend on me to give you my honest thoughts on books, free or not!) Unfortunately, I’ve been a bit remiss in writing reviews lately, so I thought I’d bring a few titles together to share in one post. Here’s a round-up of new books that have landed on my desk that I thought are definitely worth checking out. Although this book is intended to give students a general introduction to the crusades, I would recommend it for anyone who needs (or simply wants) a factual and more balanced overview of crusading. Allen covers everything from the most general details (timelines of each crusade) to the specific (anti-Semitic violence by crusaders). Not only is it an easy read, but it sheds much-needed light onto a topic that is a hotbed of misinformation in the world today. Readers will be pleased to find that not only does it give them a great overview, but it also makes life easy with a timeline, glossary, and “who’s who” section to help them keep on top of the details. These aspects, as well as a case study on peace negotiations between Richard I and Saladin, make it a great teaching tool for any medieval course that wades into these waters. More Muslim sources would be a good addition, but this slim volume will give anyone new to learning about the crusades a firm footing on which to build. I have to admit, I was skeptical about this book when I first saw it come out. I wondered how talking about the features of manuscripts could keep a reader engaged for so many pages. But I admire Christopher de Hamel, so I gave it a try, and I was very pleasantly surprised. De Hamel is a charming narrator, and his enthusiasm for the most interesting parts of the manuscripts carries you along effortlessly. Apparently, de Hamel had envisioned this book as a conversation, and that’s exactly how it’s turned out: reading it is like sharing a cup of tea with someone who’s had all sorts of interesting adventures behind the curtain, and who relates all the details with warmth, humour, and an undisguised love for books. And the pictures are stunning! If you’ve been pondering this book but feeling a little bit of trepidation (It’s long! Will it be interesting? ), get yourself a hot drink and just open the book. Soon, you’ll be as charmed as I was. As with crusading, the entirety of such a huge subject as intellectual disability can’t be contained within the covers of one book, but Metzler’s is a good starting place to look at ideas of intellectual disability during the medieval period. It’s tricky work – wording alone is difficult given historical (and contemporary) prejudices – but Metzler does her best to tease apart terminology and context to give us a look into how these marginalized people navigated medieval society. She covers medieval thought on natural science, theology, and law, demonstrating the categories into which medieval society divided people with intellectual disabilities, and the ways in which this affected their lives. Spoiler alert: medieval society was a mix of compassion and intolerance, legal tangles and well-meaning people. 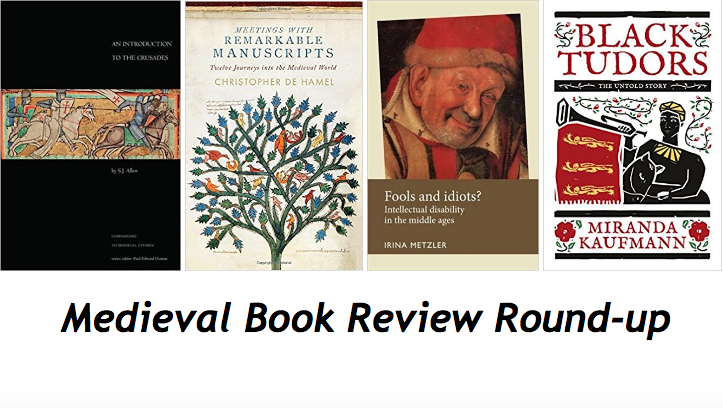 Books on disability in the Middle Ages are vital to our understanding of the period as a whole, so reading Metzler’s foray into the field (as well as reading the discussions it has sparked among disability scholars) will be an enlightening experience. NB: Unlike the others on this list, this is definitely an academic book, not geared to the average reader. For too long, people of colour have been erased or dismissed from the pages of history when their stories were right there for the telling. The brilliance of Kaufman’s book, though, lies in its how she tells these stories. Kaufman has chosen to tell the story of a diverse England through the lens of a few, select individuals. Naming them, associating them with their professions, leading the reader through their life stories, and showing some of their pictures humanizes these historical people in a way not easily dismissed by those who so often call diverse depictions of history a forced attempt at political correctness. Kaufman’s prose is also so readable that it’s the type of book you can pass along to someone with entrenched ideas about Tudor England without worrying about it being too stuffy to be read. The book is up for the Wolfson History Prize this year, and no wonder. If it’s not already on your to-read list, add it.